An Italian scooter sold in Germany designed to impersonate a car. 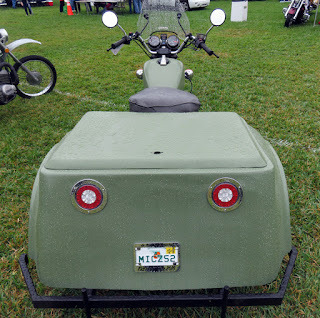 Every year I find some motorcycle or scooter I never knew about at the Dania Beach Vintage Motorcycle Show. At the 2019 Show it was the 1956 Lambretta NSU Auto Roller, shown by Bar Hodgson of Ashburn, Ontario. 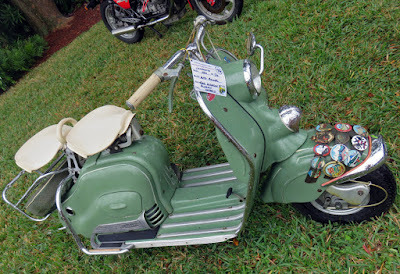 With the exception of the classically shaped Vespa, the motor scooters of today seem intended to look like the all-out sports bike a kid wants, while possessing no more power than the parent wants the kid to have. 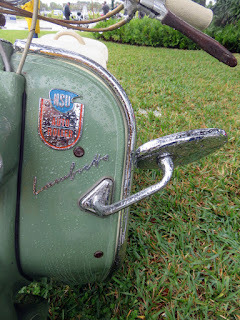 With the exception of the classically beautiful Vespa, which was around in the 1950s, the scooters of that time seemed to emphasize their substantial bulk, comfortable accommodations and weather protection. Scooter's lumpy shape belies some exquisite touches, like this mirror. I suppose the difference is that today's scooters are toys, while the original scooters were "cars" for people who could only afford two wheels. "Auto Roller" suggests a relationship with automobiles, doesn't it? Note the "adult" pastel shade of the paint. The impressive shiny trim outlining the scooter's body. The commodious floorboards that wrap around to accommodate the passenger's feet. And twin seats, elaborately sprung by a complicated mechanism. This Auto Roller is well traveled in the Alps if tags speak the truth. An electric horn commands respect on the road from within a shiny bulbous fixture at the front. No mere squeeze bulb horn for this scooter! 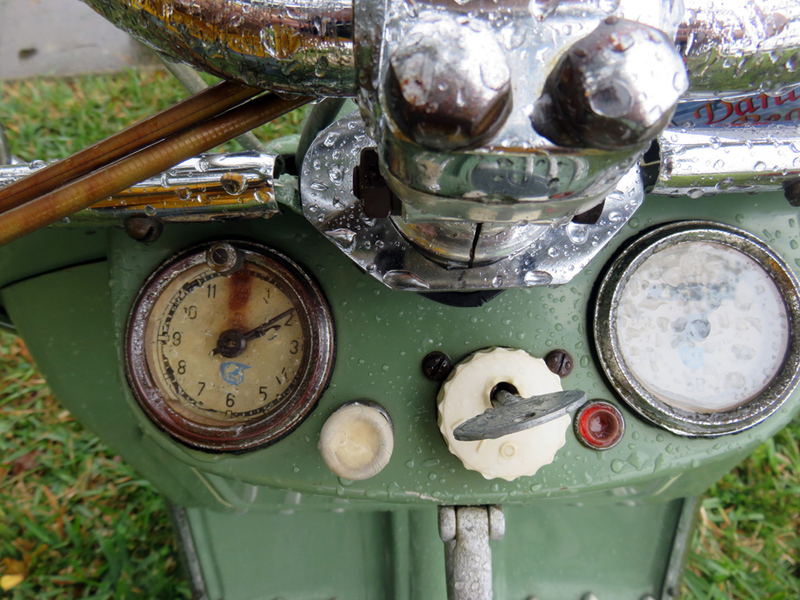 The instrument panel holds a clock, as might the dashboard of an expensive automobile. Auto Roller dash gives you only two instruments and one is a clock! 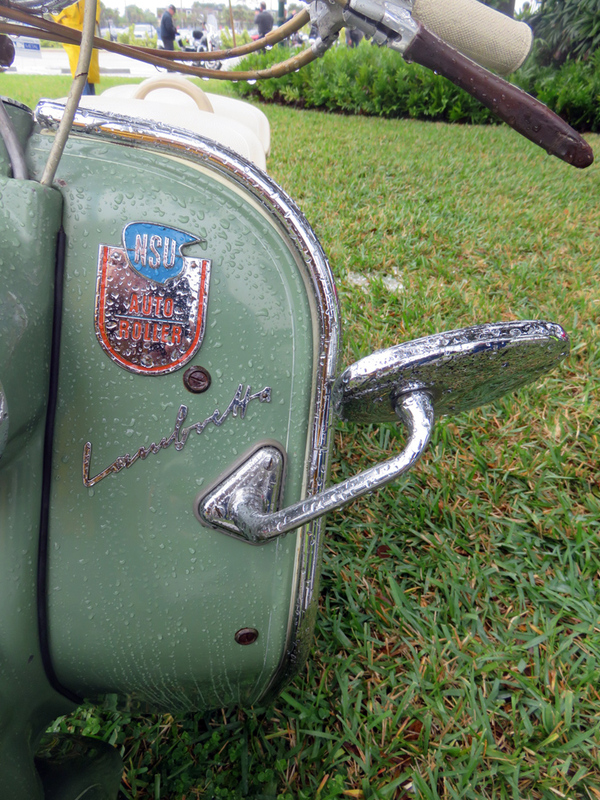 Based on its name, the NSU Lambretta Auto Roller is an Italian motorcycle built under license in Germany. 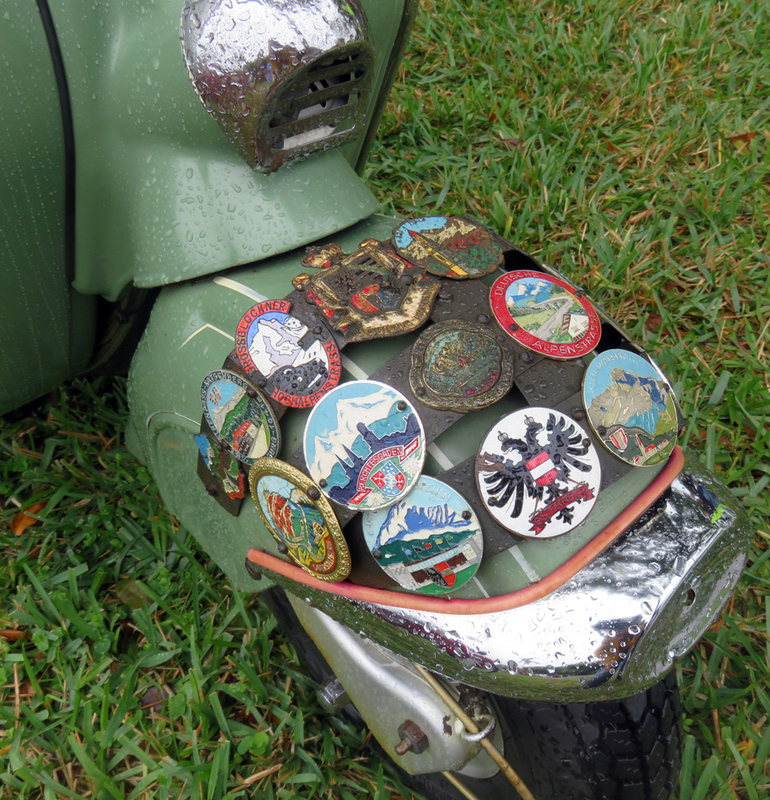 This one adds a distinctly German touch with regional badges attached to the front fender. A Honda-based trike designed for the police. Another vehicle new to me was the 1982 Honda Trident police bike shown by Kevin of Pompano Beach, Fla. Ever seen one? 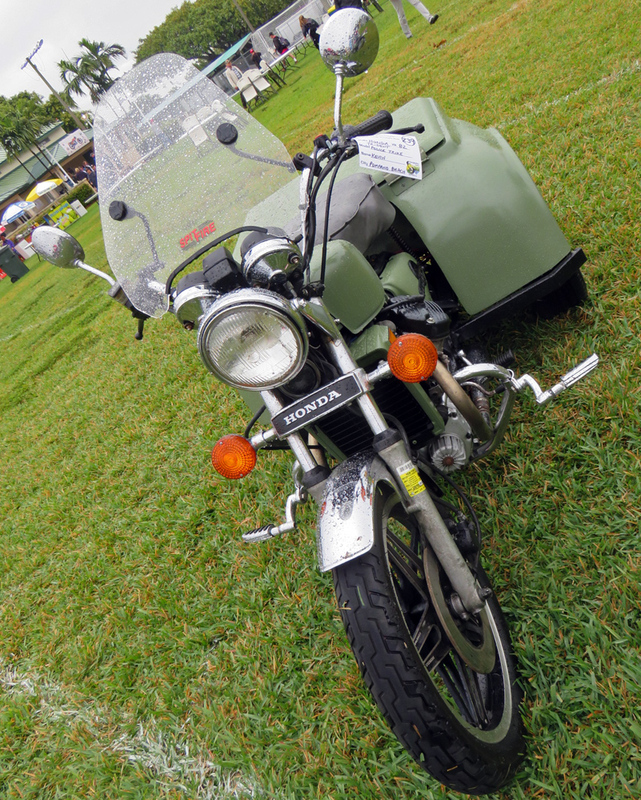 They're said to be Honda CX500 motorcycles converted to tricycles by a company called Trident. Not a straight forward conversion; they had lower gearing than standard, a parking brake and an electric motor to move it in reverse. 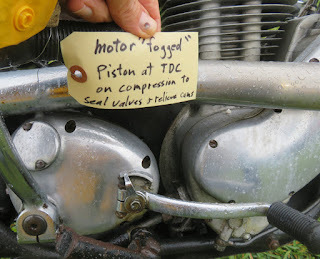 Trident logo on the side identifies the maker. Does this box make my rear end look big? The Dania Beach Show always gets an impressive collection of vintage bicycles. 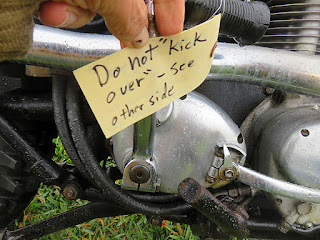 The connection to vintage motorcycles is easy to see. 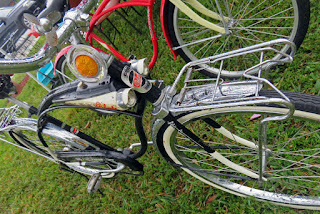 Back in the day motorcycles looked a lot like their pedal-powered ancestors, and bicycles tried to look like motorcycles, with lights, chrome, fake gas tanks and racy names. 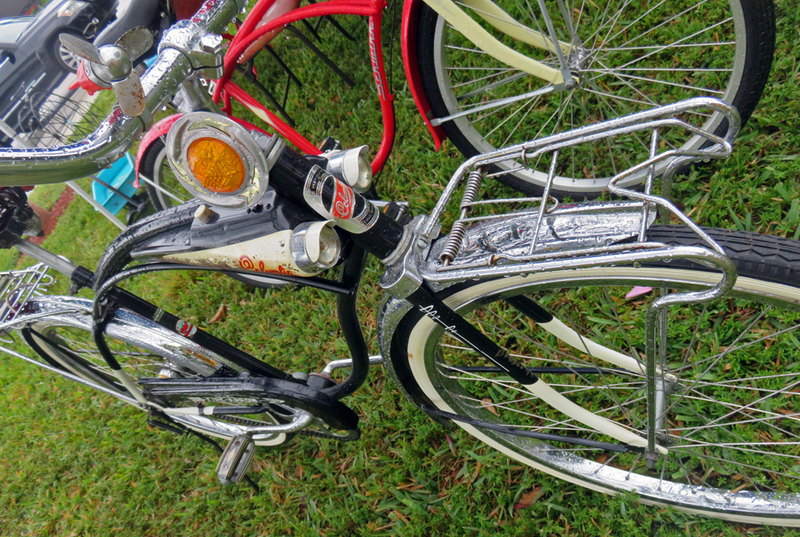 Dual headlights, faux gas tank, front and rear racks on Columbia bicycle. 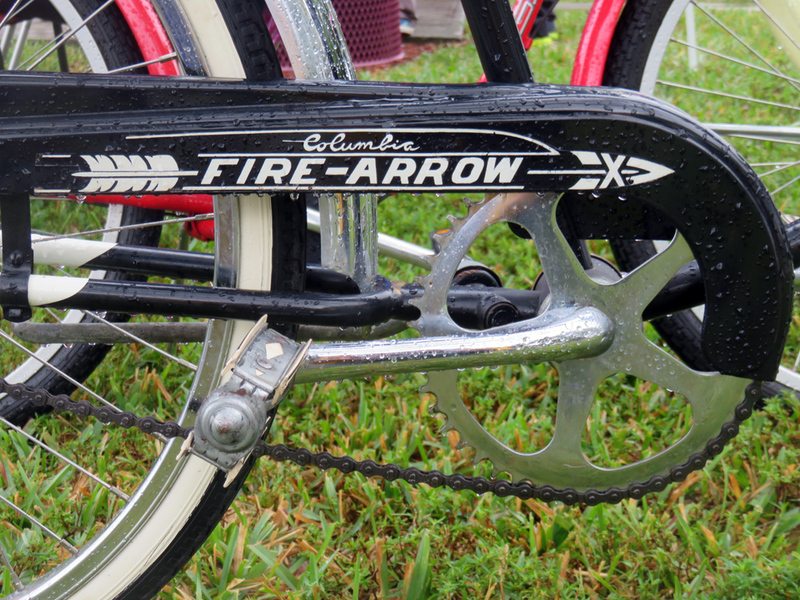 I especially admired the Columbia Fire-Arrow of the 1950s at the show, with its twin headlights and accessories. Tiny propellers were cutest touch on the Columbia. Fire Arrow is a great name for a motorcycle. In fact, Royal Enfield built one for Indian. 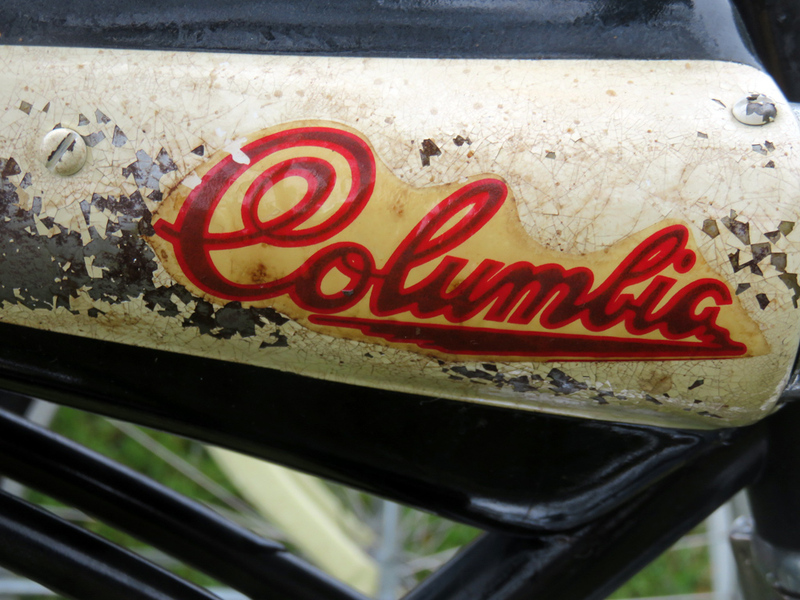 Columbia logo on its pretend gasoline tank. Then came the high-risers. 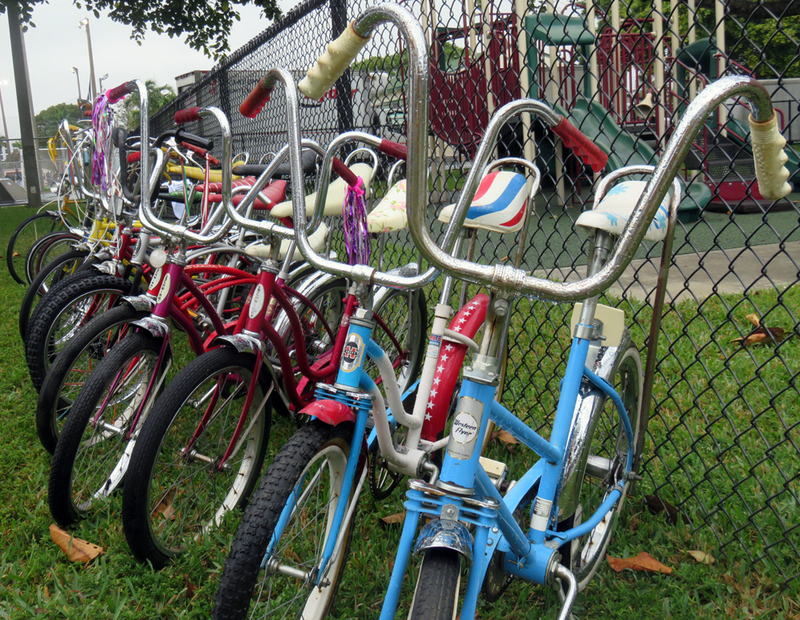 Western Flyer, Huffy, Schwins here. Finally, here's a little mystery for you: A "Don't kick over, see other side" tag on a 1966 Matchless GS80CS shown by Mark Williams of Punta Gorda, Fla.
"See other side." Who could resist? Can you guess what it says on the other side of the tag? ...and here's what it said on the other side. Better yet, could anyone resist turning the tag over, just to see? 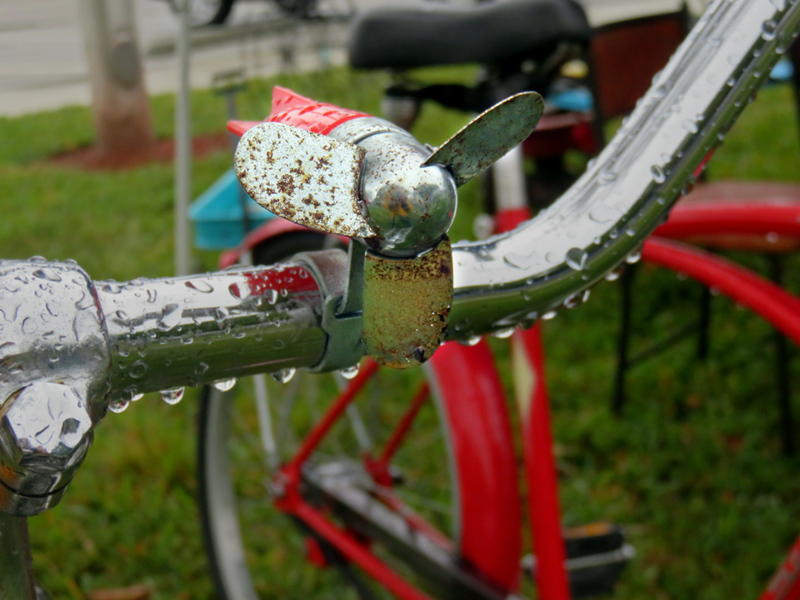 Photos from the 2019 Dania Beach Vintage Motorcycle Show. I leave both my Enfields on the compression stroke just to seal the valves and to take pressure off the valve springs, more so over long lay offs.